This was a very unique experience for us (and would be for anyone) because paddling through the middle of a lively downtown in the third biggest city in the United States, surrounded by the sights and sounds of big tour boats and some of the most unique architecture anywhere couldn’t be anything less than captivating. Almost none. The tour guide noted the gradient, and specifically that the river runs in the “wrong” direction. Indeed, the reversal of the Chicago River is a civil engineering marvel. When sewage and garbage began to seriously affect the city’s drinking water, the solution was to reverse the flow of the river (a very basic explanation is that the river takes water from Lake Michigan and empties it into the Mississippi River). It’s a very interesting thing to read about. Water levels are always reliable – it’s the Chicago River, afterall. Urban Kayaks located on the south side of the Riverwalk near the Columbus Drive Bridge, Chicago, Illinois. Time: Put in at 7:00p. Out at 8:45p. Wildlife: Seagulls, mosquitos and a giant deer sculpture. If you’re in Chicago here’s a really unique and fun way to see the city – especially compared to a tour boat trip that doesn’t offer you quite the same duck’s eye view. Gazing up at all the mirrored skyscrapers from river level was one thing, but when you add the waves of passing boats, breathing in diesel fumes and listening to trains rattle past, sirens sound, car traffic on the bridges – it’s complete sensory overload – but a fantastic experience. 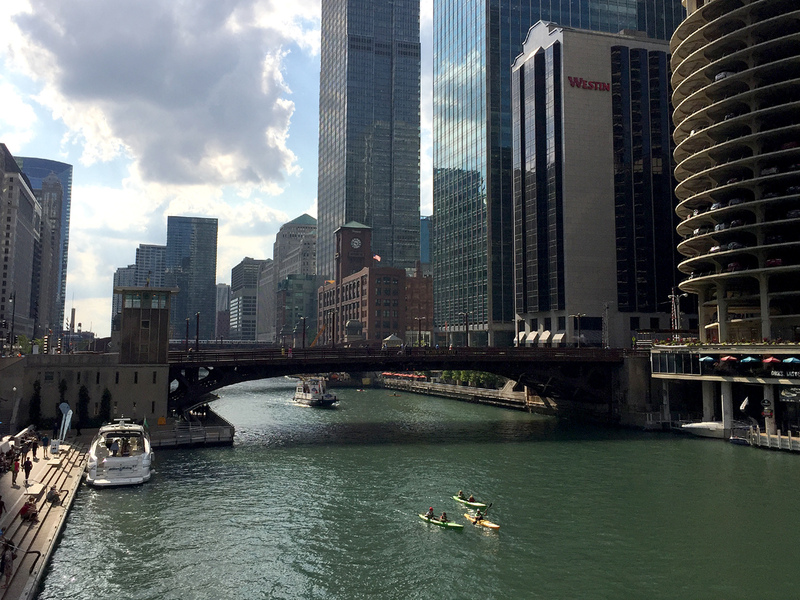 We’re not even kidding – if you have the opportunity – definitely consider a kayak tour on the Chicago River. We chose Urban Kayaks for a sunset tour starting at their Riverwalk location which just opened May 1, 2017. They have two locations, the others is located at Streeterville based out of the Ogden Slip just a block west of Navy Pier. There are slight differences between the two locations and services – consult their website at urbankayaks.com for more details and current prices. Rentals are available on a first-come, first-served basis, and there is a skills assessment test which we were not subject to for some reason – maybe because we had a guide and/or all had experience (or maybe they heard we were Miles Paddled folks – ha ha). They rent kayaks to experienced paddlers and have other tours and lessons as well. Their boat-loading process is very efficient – equipped with a two-sided slide/launch. One boat can launch to the right while another can pull up on the left. The ramp is partially submerged and the sides have hand rails to either slide your boat down the entrance or pull yourself up the exit slide. It’s super easy! Our guide, Melissa, was great – good energy and on point for navigating safely around the big boats (and extra bonus for mentioning Wilco as part of the architectural tour notes – we’re rather smitten). She alternated between talking on a two-way radio to help guide us past the big boat docks and also provided narration via a headset connected to a megaphone on her kayak. She had to stop speaking frequently due to the trains, giant tour boats blaring their own information, as well as recreational boats blaring music. The tour was decent in terms of content although there were a couple people from our group who wished there had been just a few more details regarding architecture and other history of Chicago. Paddling itself was easy since it’s essentially big flat water. But there are lots and lots of waves caused by much larger boats, and the big boats have the right of way so you have to be aware of them creeping up behind as well as steering clear. Heading inland on the main stem, it’s also important to avoid the large tour boats that are launching from the docks on river-right (after the first few bridges the large docks end). The traffic was heavy in spots but as long as we were alert there was no real danger. Also, there are boards all along the walls (faux banks) of the river that you can grab and hang onto if you need a break from heavy traffic, or just to get out of the way for a bit to wait for the larger boats to pass. What’s nice is the kayaks we rented were 10-foot Wilderness recreational models that were very stable, adding an extra feeling of security. After putting-in, we headed out towards Lake Michigan, but just under the N. Lake Shore Drive bridge to get familiar with the river and take-in a brief view of Navy Pier. Then, we turned around and headed west into the city. Then, there are a seemingly endless amount of bridges to paddle beneath. From the start of our trip to the end you’ll venture under (in order) Columbus Drive, North Michigan Avenue, North Wabash Street, State Street, North Dearborn Street, North Clark Street, North LaSalle Street, North Wells Street and North Franklin/Orleans Street – that’s quite a few. All of the bridges are drawbridges to allow really big boats and tall sailboats to pass through. We didn’t get to see any of them “draw” but it would’ve been cool. One interesting fact we learned was that Chicago has the second most drawbridges in the world after Amsterdam, but Chicago has the greatest variety of drawbridge designs in the world. Kind of cool, right? On our tour, we stopped several times along the way – a couple to avoid boats and a number of times for Melissa to explain the surroundings and share some good stories, primarily related to the architecture and history of the area. Amongst many things to be seen, some of the buildings of note were the Wrigley Building, the Tribune Building, and well, Trump Tower. There was also one fascinating art installation – an enormous deer statue situated along the Riverwalk towards the end of our trip. Melissa couldn’t explain the statue and said it had only just appeared within the last week (the section of the Riverwalk at the split in the river is the newest and just recently opened). So of course, we had to check into it and learned the deer statue is 12-feet high and 20-feet long and apparently just popped up overnight at the end of June. “Deer” (2015) by artist Tony Tasset, is one of five pieces of art being installed along the 1.25 mile long Riverwalk. We ended the tour where the river forms a Y as the north and south fork meet the main stem of the river. There, we turned around and headed back the way we had come, seeing the paddle from a different perspective now – in reverse. The golden hour was fading away to dusk but our kayaks all had rear lights on them (and easily turned on by the paddler). When we returned to the kayak slip, another group was putting-in so we took turns loading/unloading on the ramp (they were going out for the Saturday night fireworks paddle which sounded fun as well – a one mile paddle from the river mouth to Navy Pier to watch fireworks – offered every Saturday night during the summer – something to keep in mind). This was a incredibly unique and educational experience. The smell of diesel fumes, giant boats and their noise pollution (but this of course, comes with the territory). While unique, this seems to be a one and done paddle for us. However, if we were a local and/or had family/friends visiting we could see doing a repeat trip, maybe even leading a tour ourselves because it’s such a different way to experience downtown Chicago. Looking west down the Chicago River. Urban Kayaks on the south shore of the Chicago River. Green and Gold in Chicago – gotta appreciate that. Awesome and easy launching rig. Water canon goes off every hour – be aware! The navy pier Ferris wheel. Y of the river where we turned and headed back. The romance of a sunset paddle. Sunset and city lights shine.